- Why Network can't be perfect everywhere. Seriously, I'm tired of having to wait for about 5mins to get a page to load. You don't want to know how long it took me to post this. - Whyy anyone would be playing music loudly by this time of the night. - Why someone would say it's his destiny to rob. Yes, I just saw it on Twitter - @l_laitan. No, I'm not judging. - Why we sometimes let stereotypes disturb us and hurt our feelings. - What the answer to this is. Any ideas? - Why I've practically abandoned this Criminal Case game. I mean, how else would I get to do some Detective work? - Why Pringles has to be this appealing. I don't know if I'll ever stop midnight snacking. Who else is guilty? I really should sleep now. I don't know how but my neighbours have lowered the volume of their speaker and the crickets have toned down on their noise. Who showed them this post?! It's mid-week. How's it been? Hope it has been off to a great start. I relate to too many of those points like the criminal case one. And the only reason I don't snack at midnight is laziness. Can't be asked to go down to the kitchen. Life can be puzzling sometimes and the more we seek answers, the more we discover. 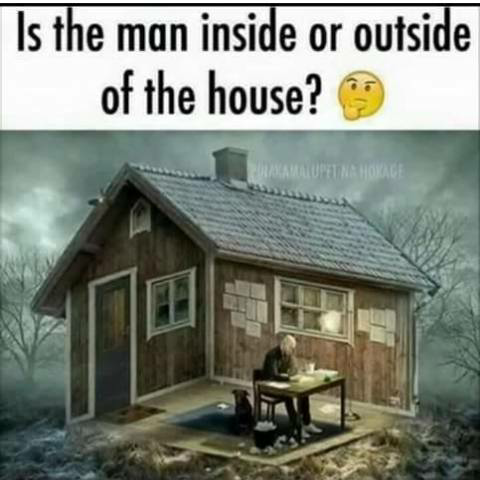 I think the man is inside the house too!